What are the different phases of rut season? Rut Season for Deer in the Southern States? When do Mule Deer rut? When do Whitetail Deer rut? Can hunting the rut help? If you don’t have time to read the entire article, then you can jump to FAQs at the end. Simply speaking, the rut is the mating season for deer. The doe will get into estrus which means the doe gets into heat for up to 72 hours, however, if the doe does not mate during this time, she can go into estrus for up to 7 times during the entire rut season. When the doe is in heat, she will exhibit sexually receptive actions and urinate more frequently to attract the bucks. The urine will then be tested by the bucks through the use of lip curling, which means that the buck gets a deep sniff and makes out whether the doe is ready or not. Nobody gets it easy during rut season; even bucks need to work hard to mate. The bucks start by rubbing their antlers on shrubs or trees to mark their territories and rub-off their velvets. After that, the bucks that have lip curled the urine will need to locate the doe. If the doe already has a mate then bucks may even fight each other and then the winning buck gets to mate with the doe. Mating is extremely exhausting for the buck and the buck will be left unable to move and panting heavily. At the end of the season, a buck may lose about 20%of his body weight and the fact that it was lost in a month just proves how exhausting it was. 1st Phase from October 26 to November 9: This season is known as ‘Seek and Chase’. Bucks are seen battling for dominance during this phase while searching for does that are receptive to mating. 2nd Phase from November 10 to November 25: This is the ‘Peak Breeding’ phase and takes place for a fortnight between November 10th and 25th. Not much seems to happen during this phase as bucks are mostly holed up with receptive does. 3rd Phase from November 26 to December 9: This is the ‘Frantic Search’ phase. The bucks will again be searching for mates during this period. The final phase takes place between November 26th and December 9th and you can potentially see desperate deer traveling long distances searching for does to breed. These dates will be fairly precise in Canada and in two-thirds of the north of the United States. The rut season is at its peak during 2nd phase, which is from November 10 to November 25, whether you are hunting deer in Virginia or northwestern Ontario. In the north, a lot of ‘fawns’ will not survive the winter because of how cold it gets. This is the reason why so many of them are born between May and June. This always means that the rut in November is always more heavily concentrated and this is certainly the case when compared with the southern states. You may find that things are quite different in the south. The rut can take place as early as October in South Carolina and as late as January in Alabama. Rut takes place over a longer period in the south due to milder climate and poor buck to doe ratio. Due to these factors, the rut season can sometimes be as long as three months. There is no need for the bucks to have to move around as much as they search for does and there is also less competition. Like rut season varies among northern and southern states, there are also slight variations in rut season among species. Thanksgiving but it varies as per location and species of deer. 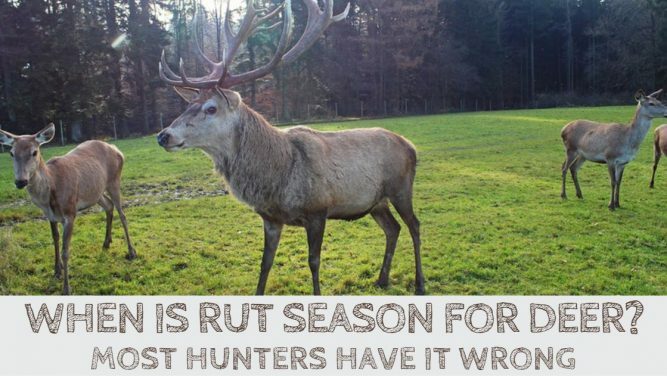 Rut season in the northern states is shorter and earlier than the rut season in the southern states. Similarly, rut season for mule deer comes a few weeks earlier than the rut season for whitetail deer. But in any case, if you wait until Thanksgiving you run the risk of only catching the end of the season or it may be over altogether. So precisely when do mule deer rut? It is difficult to pin down exact dates but we have some facts to help us. The average gestation period for mule deer is 202 days. We also know that peak fawning dates for mule deer in most years are June 1 to June 7. Now if we move backward, then the peak rut period works out to be Nov 11 to Nov 17. As per most biologists, it is difficult to predict exact dates as the rut season for mule deer is dependent on various factors. Photoperiod: This is the amount of daylight that occurs in a 24 hour period and is dependent on latitude. Photoperiod is the foremost factor which governs the timing of rut at any given latitude. Location: Rut season for mule deer is shorter in the north than in the south. Due to a harsher climate in the north, fawn births need to be timed well to provide a better chance of survival. The intensity of the rut in the northern states in also higher due to a shorter period. Whereas rut season for mule deer in southern states is spread over months. Behavior: Dominant bucks breed more does during the rut season; however the bucks decide the pecking order among themselves much earlier. The bigger bucks tend to drive off smaller bucks during the rut season. Which means if there are fewer bucks in an area then the rut season would be longer due to poor buck to doe ratio. Referring to existing biological research can be a good way to try and determine the rut season for mule deer. A study of mule deer carried out in Colorado showed that there was a 20-day window during which 70% of the does were bred. Although the average gestation period was 202 days, some fawns in the study were born as early as 170 days and others were not born until 230 days. A similar carried out in National Bison Range on mule deer showed that the median date for breeding ranged between November 1 and December 1.
then the southern states. Among species, rut season for whitetail deer comes later than the rut season for mule deer. So the question now is: When do whitetail deer rut? You may have heard theories that the phases of the moon influence peak breeding for whitetail deer, however, there is no scientific evidence to back up this myth. As per most biologists, the photoperiod has the biggest impact on when the deer breed and this is why the rut season varies as per latitude. Although it is difficult to precisely predict the timing of rut season for whitetail deer, there are certain dates which can help you plan your next hunting trip. You should remember that these dates are only a guide. In fact, there are many other factors that can affect the rut season. Factors such as buck to doe ratio, weather and climate may cause the rut season to be varying across regions or in any given year. Pre-Rut: Phase One. Rut season for whitetail deer usually begins between 18th October and 2nd November. Seek and Chase: Phase Two. Next stage takes place between 3rd November and 12th November. Peak Breeding: Phase Three. You will want to look out for this period. Rut season for whitetail deer peaks between 13th November and 24th November. Post-Rut: Phase Four. The last phase takes place between 25th November and 15th December. Several research studies have been carried out by biologists that can be used to determine the rut season for whitetail deer. As we believe in giving you information backed by facts and not myths, we are sharing summary from a couple of such research studies. In one of the studies, 6000 ‘does’ were observed by the Pennsylvania Game Commission. As per their observation, breeding of 90% of the ‘does’ occurred between the mid-October and mid-December. The study also showed that the peak of the rut season for whitetail deer occurred around mid-November. In another study, the Minnesota DNR studied the conception dates of over 1600 whitetail deer and found that the earliest conception took place on 1st October and the last one took place on 28th January. All other conceptions occurred between these dates, with most falling between 19th November and 24th December. The short answer is YES! Deer are extremely shy and cautious, which makes hunting deer extremely difficult. As rut encourages the deer to move, it enhances your chances of spotting one. Buck deer tend to lose most of their natural caution during the mating season. If you wish to be a successful hunter, then I would encourage you to spend a lot of time in the field throughout the season and not just during the peak rut period. Question: When is the rut season for deer? Answer: The rut usually starts towards the end of September, peaks in the middle of November and lasts till mid-December. As it is not easy to predict the precise dates of the rut season for deer, our recommendation to all hunters is to start monitoring the deer behavior at least a few weeks earlier so that you do not miss out on your trophy hunt. Question: What are the different phases of rut season for deer? Question: When do Mule deer rut? Answer: Most biological research indicates the period between Nov 1 and Dec 1 as the rut season. If we try to work backward from the peak fawning dates, then we get the period Nov 11 to Nov 17 as the peak rut season for mule deer. Question: When do Whitetail Deer Rut? Answer: Breeding of nine out of ten whitetail ‘does’ occurs between mid-October and mid-December. The average peak day for the whitetail rut in the U.S. is November 13. Question: What is ‘rutting moon’? Answer: Many hunters believe that deer rut is controlled by the lunar phase and that the deer rut usually peaks 7 days after the second full moon during October and November, known as the ‘rutting moon’. However, this belief is not supported by facts as the ‘rutting moon’ coincided with the peak rut only 4 times in last 15 years. You can often hear hunters asking when the rut is going to occur. It’s a question we hear very frequently in the fall. All seasoned hunters want to ensure that their hunting vacations include the rut season. It is difficult to predict the exact rut season for deer as the timing varies as per latitude and species. As a general rule of thumb, rut season in the north occurs earlier than the south and the rut season in the northern states is much shorter. Although hunters are always looking for peak rut, you will find that breeding does occur up to two weeks before the peak and continues for up to a month afterward. As bucks lose their caution and deer are moving, rut season provides many opportunities for hunters to spot deer. But, you need to prepare well before you go hunting and be extremely alert during the hunt. You can continue reading with our next article, Where to Hunt During the Rut, to find out best practices for choosing between public spaces or private land for your next hunting trip. Good advice and document to read. Very soon this site will be famous amid all outdoor lovers due to its nice and content-rich articles. Hi there, its good piece of writing on the topic of deer rut. Your site is a wonderful source of facts. Thanks for sharing your thoughts. I really appreciate your efforts and will be waiting for your further posts. Thanks once again!